Matt finish texture & shaping paste. - Incredible ultra matt finish. - Gives choppy & rough style distortion. - Apply a small amount into dry hair. - Style and texture as you wish. 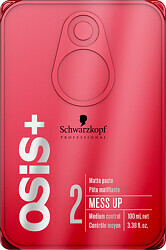 Schwarzkopf Professional Osis+ Mess Up Matt Paste 100ml is rated 5.0 out of 5 by 4. Rated 5 out of 5 by Tintin01 from Excellent I have used this for years, but have paid at least twice the price by buying from the salon. I was so delighted to find it on Escentual. I've got short, choppy, white hair and this paste is great to provide definition and control. I've used loads of other products, high end and cheaper but this is always the best. It lasts for ages as a little goes a long way. The packaging is great too - really neat to pack when travelling. Rated 5 out of 5 by Sully from Schwarzkopf Professional Osis+ Mess Up Matt Gum Very pleased with my purchase this is the best value found online especially with a top sales discount. Rated 5 out of 5 by Fubuki from Great product Excellent product for that invisible look. Hold is amazing and has no greasy traces of even wearing a hair product. Highly recommend it.